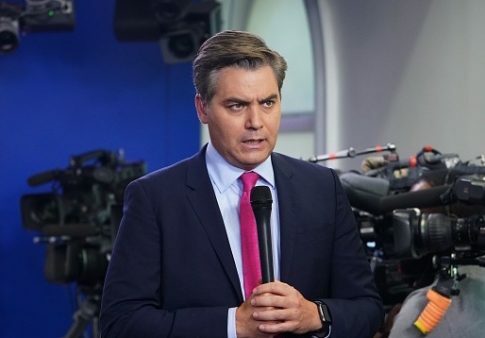 CNN reporter Jim Acosta confirmed no crisis existed along a walled portion of the U.S.-Mexico border during a visit Thursday. In a video shared to Twitter, Acosta pointed to "some of the steel slats that the president's been talking about." Walking along the border in McAllen, Texas, Acosta noted that the president has warned of a national emergency at the unwalled portion of the southern border. Acosta observed that this emergency did not exist along the portion of the border that had already been secured with steel slats. "As we're walking along here we're not saying any kind of imminent danger," he remarked, patting the border barrier with his hand as he filmed himself. "There are no migrants trying to rush towards this fence." President Donald Trump campaigned on a promise to "build the wall" and secure the border. Though the rate has decreased in recent years, hundreds of thousands of foreign nationals cross the southern border into the United States every year. Democrats have refused to provide funding for the president's border wall, though many have voted for it as part of larger immigration bills in the past. Speaker of the House Nancy Pelosi (D., Calif.) jokingly offered the president one dollar for the wall and called it immoral. Senate Minority Leader Chuck Schumer (D., N.Y.), have refused to accommodate Trump's wish to build a border wall. "He is not going to get the wall in any form," Schumer said last month. Some Democrats, like Congressman Hakeem Jeffries (D., N.Y.), have agreed that "enhanced fencing" would in fact help secure the border. The estimated cost is between $2-5.7 billion dollars. In an address to the nation from the oval office Tuesday, Trump stopped short of declaring a federal emergency to secure unilateral authority to fund the wall. Now in its twentieth day, the government shutdown is approaching the longest of its kind in American history. The president is set to visit the border in Texas on Thursday. This entry was posted in Uncategorized and tagged Donald Trump, Government Shutdown, Jim Acosta. Bookmark the permalink.